Lake Tahoe - North Vacation Rental #9399 LakeHouseVacations.com Rent Me! Featuring forest views from the living room, this wonderful vacation rental is beautiful any time of the year. Bright and cheerful with room to sleep eight, Rock Beach is the place for you! The entry level includes two bedrooms. The master bedroom has a king bed, TV, and a glass sliding door to the covered deck. The second bedroom has a cozy queen-size bed. There is also a full bath with a tub/shower. The laundry closet is just across the hall. Relax and warm up by the wood burning fireplace in the living room. There's a large flat screen TV with cable and DVD player, plus a comfortable leather sofa, chair, and ottoman. Wi-Fi keeps everyone connected and the adjacent covered deck features a gas barbeque. With all those mouths to feed, it’s handy to stay in for some of your meals. The well-equipped, open concept kitchen includes everything you need, especially the all-important dishwasher. There are six chairs at the large dining table and three stools at the breakfast bar. On the loft, you’ll find one queen bed and one set of bunk beds—a perfect space for the kids or a small family to call their own. You're only 10-12 miles from three great ski resorts—Northstar, Alpine Meadows, and Squaw Valley. Whether you prefer to downhill or cross-country ski, snowboard, snowshoe, or go sledding or ice skating, North Tahoe is the place for every winter activity. Year-round, the Village at Squaw Valley offers dining, shopping, the Squaw Valley Aerial Tram, and a variety of activities. Sleeps 8 guests - clean and comfortable." The linens, although clean should be replaced - a little bit worn out. " Check in experience was uncomfortable, missed housekeeping items (hair in bathroom, stain on master bed). Great location, clean pool. Was left feeling underwhelmed." Clean, easy to find, affordable. " Overall, we were very pleased our accommodations. The unit was clean and very well located. Some updating needs to be done. Refrigerator and washer/dryer are not in good shape. The kitchen could us a facelift. " It was really nice clean and convenient would stay again"
First impression was very strong. House has 2 bedrooms and a full bath downstairs with tons of closet storage. Second floor is the great room with a huge dining room table and great kitchen. Upstairs is a loft with a queen bed and a bunk bed. We slept 3 adults and 1 child very comfortably. 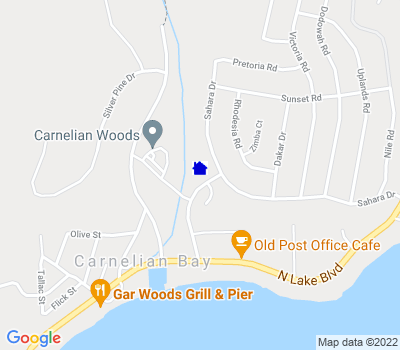 Great location in Carnelian Bay, walking distance to great restaurants and trails, andample parking make this spot a great go-to for the future. " - Both the bathrooms had locks, but they didn't work. - For checking out, the instructions in the house mentioned to leave the house keys and parking passes at the recreation center, however I was later told that the house keys needed to be left in the lock box at the house itself. - The recreation center had a few games, but only a few worked, the pool table was out of order and the guy at the desk told us not to play air hockey because it was too loud. What? - When we were leaving to check out, we opened the front door only to find someone had packed a 6 foot pile of snow at the front door. It took us a while to kick through it and were freezing having to deal with it! Not sure if this was just a prank by some neighbours or if the owners were disliked by someone around but this was a little unsettling to deal with at the end of a vacation. I have mentioned this to the management and hope for a response to this soon." This 3 story condo was not at all kid/toddler friendly or handicap accessible. The layout, which is not mentioned in the description, is 2 bedrooms on the entry level, kitchen and living on the second floor and an open loft on the third floor. The railings in the loft were far enough apart that my daughter could fit her body through. The child gate provided does not secure in any way and there is only one for two sets of stairs. The back right burner of the stove didn’t work. The handle on the coffee pot fell off while pouring hot coffee and spilled the entire hot pot. TV didn’t work with reception. Internet was in and out. Bathroom doors didn’t lock. Not enough comfortable seating for 8 guests. We had to take turns sitting on the couch or kitchen chairs/floor. Everything was very old and used. Noise traveled throughout the entire house. Minimal kitchen. Showers inexplicably turned ice cold mid shower. It’s a good enough place to sleep and that’s about it. Would not recommend this condo in the winter if you want to cozy up inside. Over priced and underwhelmed!" Love Tahoe vacations and getaways, decent condo layout for family/friends but lousy kitchen and rec center staff. If you don't mind a lame kitchen (plan to eat out) and just sleep and hand here, don't need the spa, then it's fine. For the price, the kitchen should be upgraded and the facilities should be open as advertised. " It is not easy to find this location, nobody helped us." Kitchen and bathrooms were horrible- They need major work. They are original to the house. Clean, but need a lot of work. The bathrooms are especially bad...really small, disgusting with mold that can't be cleaned any more. NEVER hot water!!! Or at least only one time in 6 days! It was bad. The master bedroom is awful in regards to the mattress and floor. The floor is scary in regards that is slants to the right SO much and feeling like you will fall through the floor. It needs to be updated/replaced very bad. And the mattress is way too soft and also slopes to the right towards the door. The carpet is dirty and needs to be cleaned or replaced. Loft- Bunk beds are nice but top bunk has no side rail. How can anyone possible sleep on top and chance falling off. And the one bunk bed sits right on the side of the over hang and you can fall off to the second floor. No barbecue! Pieces missing for barbecue to work. Great TV package with tons of movies- thank you to quick response from lake accommodations to quickly fix the downstairs tv when not working. We would NEVER rent this place again. And we would NEVER recommend this place. Has potential to be great if those things were improved. Thanks"
Stay in the same townhouse complex every year. Love north Tahoe"
The condo is located in a great location, and was in overall pretty good shape. Several problems however, the refrigerator didn't work for three days and a shower wouldn't turn warm for the first day. The shower was repaired immediately, but the fridge took a while. The management company was professional and prompt, which made the problems manageable." The condo has a lot of great things about it, the space and layout are nice and spacious for our family of four. The living room and dining room furniture were nice and comfy. The only issue is that the kitchen and bath rooms are probably original to the condo, 40+ years old? The bathrooms are ok (counters and toilets are very low) it is the kitchen that really needs to be updated. It seemed ok for making breakfast and snacks but not great for making a meal. the counters and cabinets were in bad shape. Other than that we enjoyed it!" Beware if you are coming with children. The bunk beds have no railings and are really shaky. We did not feel we could safely use the top bunks. We carried the mattress down from one and put it on the floor. And we stuck the fourth child in bed with the parents. Also, the bunks are lofted so they are wide open to the communal area. If adults plan to stay up after putting kids down, forget about it. Too much noise. The kitchen is minimally equipped and the whole place is just ok."
We loved the location which is a short walk to the lake. Kings Beach, Tahoe City & a great park were a short drive away. Just a heads up that the unit doesn't have A/C. We didn't realize that when we booked but even staying in August we did not need it as the condo stayed cool. The condo is nice but it seemed a little dark. We thought the bunk beds in the loft would be great for our kids but once we saw them we chose not to. The top bunks do not have any side rails and the one bunk bed is literally next to the loft railing. If you have a restless sleeper this could easily become a horrific scene. Towels provided were pretty cheap & thin but served their purpose. Would recommend if you are looking for a convenient and generally comfy place. Just don't expect high end amenities." Quiet, comfortable, beautiful views and easy access to restaurants and beaches." Overall it was great. It was very comfy and exactly what you need to your snowboarding adventure. " This was a great place to stay. The location was within easy driving distance to several ski places. We arrived in the evening and I was carrying things in from the parking lot. A young man named Chris, an employee of the complex, came through to plow the lot. I asked him where the office was located since I had to pick up a parking permit and the access keys to the rec room. Rather than just give directions, he went to the office himself and came back with what I needed while I finished unloading. I will defiantly stay here again. The place was comfortable and had everything we needed. " very nice place. easy access to and from. bbq on patio was fun. the shower head is low (like 5') was my only complaint. " Condo was very nice up to date and clean. The only downside was that the TV cable package was very lacking, most of the common popular stations were not subscribed. There were only 2 small pieces of firewood in the fireplace and none extra. We had friends who rented a different unit the same weekend. they had a full cable TV package, and a storage closet full of firewood in their entry way. Other than those two things we were very pleased with the unit." This unit has pros and cons. The pros - The TV was awesome, but I wish they had put it above the fireplace since it blocks the view to the outside. The couches were very comfy and the master bedroom was great with a comfortable mattress. Our daughters really liked the loft area. The bunk beds were fun. The cons - The unit is in serious need of some upgrades. The carpet is very old and needs to be replaced or at minimum could us a good cleaning. The kitchen is VERY old, quirky and has the bare minimum. We managed, but would not want to do any kind of serious cooking there. The counter space is very limited due to the built in butcher block cutting board. We rewashed many of the pots before using them. There was a very strong unpleasant odor in the unit. We immediately bought a scented candle to try to mask the smell. The bathrooms were very dated with very low shower heads. I am 5'6" and the water came at my chest. It was really challenging for my 6'5" husband. The bath towels were very cheep and rough. We had issues with the hot water that required attention and the blinds (both upstairs and downstairs) were not working properly. The management was very good at responding to our requests and easy to work with, but overall, this unit was disappointing. We did a lot of research to find a good place since we were staying for 6 days. For the price we paid, we thought it would be much nicer. We have stayed in many condos in Tahoe, some much less expensive and in better condition." This property could use a face lift and offer some additional kitchen supplies. The property has 3 levels - lower with 2 bedrooms in good condition and a bathroom that has vent covers and towel rack falling off; second level has a living room with only working TV, dining area, bathroom, and super basic kitchen; the third level has a set of hand made and unsafe bunk beds. One bunk bed is so close to the top rail that it is completely unsafe for children to sleep on. We had no hot water to shower, but a plumber came immediately to help fix, yet not giving us complete warm water for all to shower (some went to the clubhouse to shower). Overall the property served its purpose, location was fine, and clubhouse was a nice amenity. " While the living room furniture was new, the kitchen was nondescript , ill -supplied , with absolutely nothing except salt and pepper available. The master bath has a very loud fan , poor lighting and broken towel bar. All the toilets need to be updated to comfort height . We had to buy a grill brush and night light for the bathroom and there were no spare light bulbs available. Poor lighting overall, with low wattage bulbs .Very unappealing." Overall the unit was great. All basic needs are available, from the kitchen to the indicated linen and bathroom basic. Very good location. Restaurants near by n rental for water activity. The lodge was also great especially when we were there,it was raining. " Excellent location, management promptly answered all the issues we had, the pool is clean. We were 4 adults and five children, everything was good for our group. The description on site is accurate." Great spot that slept at least eight, close to the lake, and quite neighborhood. A little dark and would be great to see more lights, but all in all a great Tahoe cabin!" The place was clean and quaint. The only issue for me was the late check in time and the early check out time made the stay shorter than I would have preferred." Was the vacation rental in a great location? Yes. Was the vacation rental management staff helpful? My only contact with the rental management was via e-mail prior to my arrival. The information provided was complete and there were no problems with arrival or departure. The keyless entry was convenient since we arrive late on the first night." I would stay here again"
Bed sheet is a letter old, but everything is good." The condo was pretty clean in general. Didn't like the bedsheets and covers, they were outdated and old. The bathroom was a little outdated as well. But over all it was an good stay. " "Comfortable, basic accommodations for 2 families of four. Great layout for 2 families of 4. The kitchen was missing some basics- i.e., the number of forks and spoons were sparse for 8 people- I don't think there were even 8 forks. Also, no spatula? It's hard to make pancakes without one, I'll tell ya! Also, only one garbage bag was provided, when we would have liked to change out the garbage mid-stay. Bed linens were a little cheap and rough. Other than that, it accommodated all 8 of us very well and had what we needed. Thanks!" The bathrubs had some hair in them, so they could have been cleaner. Otherwise, very clean. Only suggestion is to have better shower heads/water pressure. Downstairs shower had very little pressure. Maybe upgrade to handheld to make it easier to clean and ensure they get the showers clean." "The people at First Accommodations have always been very helpful to us. This year this was especially true. "The unit was very nice and clean. Overall, a fun property. Slight draw backs...they could use more silverware, utensils, and pans. Also, there was a strange smell all week in the downstairs bathroom, and the neighbors had complained about seeing mice. We didn't see any evidence, but heard one getting into things one night. " Would like to have more items in kitchen, blender, more serving bowls, pitchers. Surprised there was no option for recycling, would love to see that as an option." A little tight for eight people. Bring you own pan to cook with there is only 1 6" frying pan and zero spatula's. Proceedures for check-out are a little cumbersom. Don't get me wrong we enjoied our stay just needed to get over a few chalenges. "